Starting January 16, guests may visit a replica of the Basilica Minore del Santo Niño at the lobby, featuring a collection of images of the Señor Santo Niño. It will also house a mini kiosk offering Sinulog memorabilia and souvenirs. BUFFET. The hotel’s all-day dining restaurant Pusô Bistro & Bar offers Cebuano classics including the famous lechon, humba, fresh kilawin, and more at the Sinulog Lunch Buffet on Sunday, January 20. As the weekend approaches, guests will witness a show of color and talent. The hotel’s very own Tribu Quest Dancers together with a Sinulog Queen will grace the lobby and present a Sinulog dance at 10 am and 2:30 pm on January 19 and 20. To perk up the beat on Sinulog Day, January 20, drum beaters Infinity Tribe will have an electrifying performance at 4:30 pm. A fiesta is not complete without a spread of time-honored homegrown recipes. 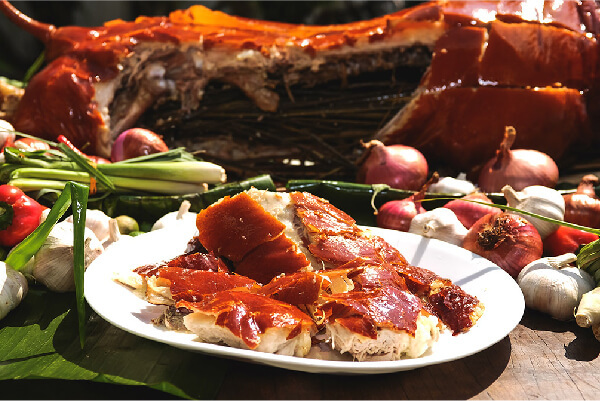 The hotel’s all-day dining restaurant Pusô Bistro & Bar offers Cebuano classics including the famous lechon, humba, fresh kilawin, and more at the Sinulog Lunch Buffet on Sunday, January 20. SINULOG QUEEN. The hotel’s very own Tribu Quest Dancers together with a Sinulog Queen will grace the lobby and present a Sinulog dance at 10 am and 2:30 pm on January 19 and 20. Guests dining in groups of 8 or more enjoy a celebratory 15% discount on the regular buffet rate. Regular rates are P700 net for lunch and P850 for dinner. To mark the wonderful occasion, a free Sinulog photo booth will be stationed at the lobby from 11:30 am to 3:30 pm also on Sunday. It truly is a fun fiesta throughout the Sinulog weekend at Quest Hotel & Conference Center Cebu. For inquiries or reservations, please call (63 32) 402 5999 or send an email to [email protected]. For real-time updates, guests may follow @questhotelcebu and @pusobistro on Instagram; and facebook.com/cebuquesthotel and facebook.com/pusobistro on Facebook.